LAST night I caught “Ma Rainey’s Black Bottom” — one of the historically earliest of August Wilson’s cycle of plays about black life in the 20th century — at the Mark Taper Forum. This production, directed by Phylicia Rashad (best known for her role on “The Cosby Show”), has been justly celebrated already, so I will just introduce it and add a few details. 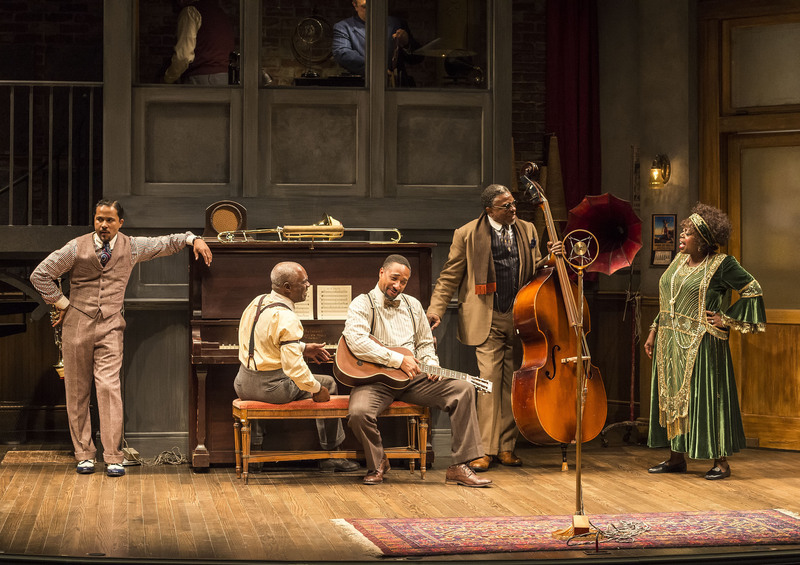 Despite its title, and an extroverted and soulful performance by Lillias White as the Queen of the Blues, the play is not primarily about Ma Rainey but the backup musicians who assembled one afternoon in 1927 at a Chicago recording studio to accompany her. It’s their chemistry with each other, their views of musical artistry, their relationship to the white mainstream, that gives the play most of its real drama. L-R: Jason Dirden, Glynn Turman, Damon Gupton, Keith David and Lillias White in August Wilsons “Ma Raineys Black Bottom,” directed by Phylicia Rashad, playing through October 16, 2016, at Center Theatre Group/Mark Taper Forum at the Los Angeles Music Center. For tickets and information, please visit CenterTheatreGroup.org or call (213) 628-2772. Contact: CTGMedia@ctgla.org/ (213) 972-7376. Photo by Craig Schwartz. It’s hard to imagine the acting in the play being any better. The four actors were convincing as ’20s blues musicians, and each had distinctive mannerisms and a lived-in worldview. The most central of the four, probably, was Jason Dirden, who played Levee, a trumpeter who saw himself as an artist and songwriter and not a mere hired hand. Remarkably, all four actors were decent musicians, and their brief bits of playing made up some of the highlights of the play. That’s partly because of the beauty of ’20s jazz and Rainey’s music in specific. It’s also because even most serious music fans have only heard the original music on very scratchy old recordings. (And because the best known music in this style was played by Louis Armstrong’s Hot Fives and Hot Sevens, the four piece version of songs like “Hear Me Talkin’ To Ya” had a lighter, more open quality.) Those old recordings are wonderful, but seeing these songs live was a real pleasure, and helped show why the play’s principles had devoted themselves to what can be such a frustrating life. Much of the early parts of the play involve comic banter and one-upmanship by the band members, and a lot of it was hilarious. Despite my deep respect for Wilson — and I understand this is an attempt to define the characters and to built a tone that will pivot very seriously — there was a few minutes too much in both acts. There was also one dramatic high point involving Levee played a hair too high for me. But “Ma Rainey” was mostly a dramatic triumph. I won’t give any more of the plot away, but I’ll just say that Wilson’s goal — to show the complexity of black life, to say something about the paradox of artistry, and to illuminate individual souls — is quite well realized by the grim conclusion. I’d not been to the Taper in more than a year, and was struck by how intimate and effective a space it is. Remarkably, while I was enjoying the play (with a musician friend with whom I sometimes play jazz guitar), the 83-year-old man who founded the Taper and played perhaps the most important role in establishing theater in Los Angeles — Gordon Davidson — collapsed after dinner, and died. More on Davidson soon, but he was a titan.